I haven’t been posting much lately because I recently found a new doctor who is actually competent and we are trying to figure out what my gut problems are beyond fructose malabsorption. I’ll post an update on that later. 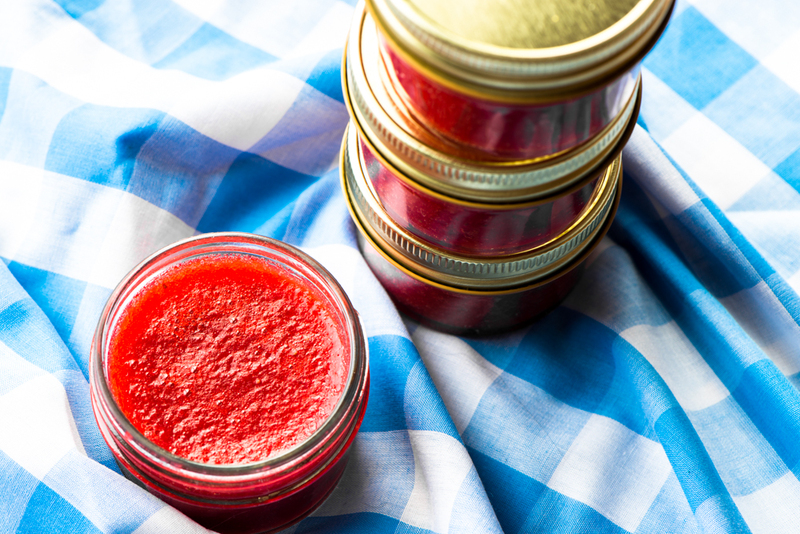 But for now…do you know how stinkin’ easy it is to make your own jam? If ease were stink, it would be the stinkiest. 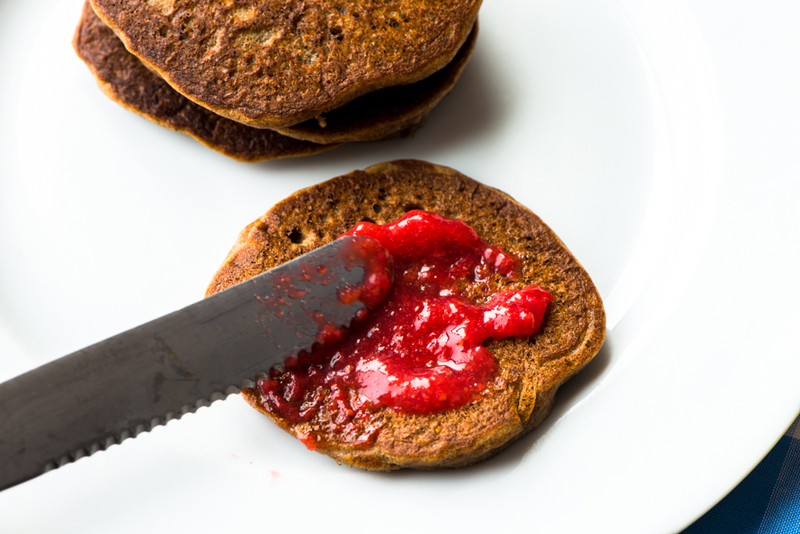 And strawberry jam is the perfect fruit to use for people with fructose malabsorption. Strawberries aren’t very high in fructose, but since they have a higher fructose to glucose ratio, we FMers need to add dextrose to eat them. You can use this delicious jam on Almond Bagels, Classic Pancakes, Buckwheat Banana Pancakes, or Faux-Chocolate Pancakes! Wash strawberries and cut off the tops. Add the strawberries and lemon juice to a blender and blend until smooth. Pour into a small sauce pan and add the gelatin, making sure to mix well. Wait for the gelatin to bloom, which will be about 10 minutes. Put the pan on the stove and bring the jam to a boil. 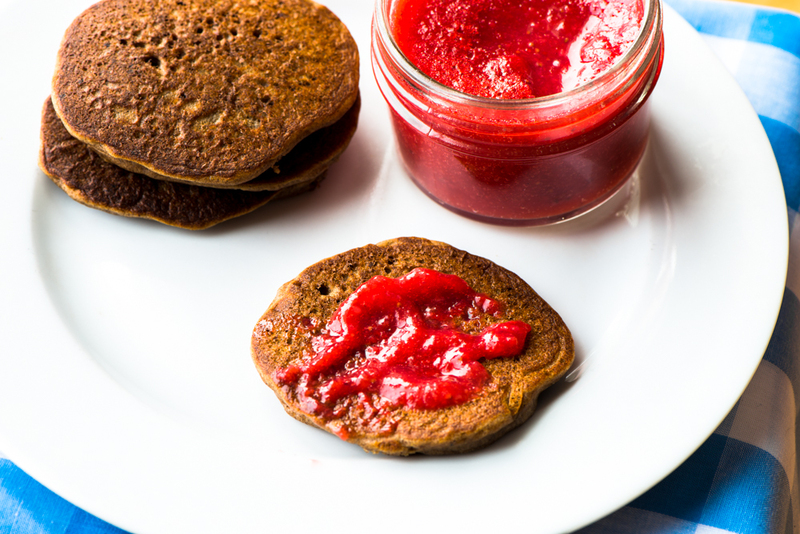 This entry was posted in Recipes and tagged dextrose, FODMAP, fructose malabsorption, jam, lemon, low-FODMAP, pancakes, strawberry by nosugarlessgum. Bookmark the permalink. Hello. I just found out that I have fructose malabsorption, and I am struggling to find out which sweetener is best for me. I have read several conflicting articles/websites. Just wondering if you can help confirm which sweetener is best. Also, is maple syrup alright for people with FM? I appreciate your insight and time. Hi, Krista. Welcome to the club! Good luck! Hit me up with anymore questions! Thank you for the response. I need your guidance again…. Is it normal to get headaches once you’ve had sugar? I mean I cut out most sugar intake 4 weeks ago but I never did the elimination diet. I have reduced my sugar intake by 95 percent, but I still have some real sugar in coffee and tea, then I get a headache in my left or right temple. This happens when I expose myself to sugar. Is this normal once you have cut back this much? I have to ask you because the dietitian in my area knows nothing about fructose malabsorption. Have you tried having the sugar by itself to make sure it’s not the caffeine in the coffee/tea? I haven’t heard of someone reacting to sugar this way–if you do I think it might be an issue separate from FM since it happens so quickly–but that doesn’t mean it’s not possible.